Thank you for voting Miss604.com the BEST LOCAL BLOG in the Georgia Straight’s Best of Vancouver. I am honoured to have your readership, your support, your engagement, and your votes. 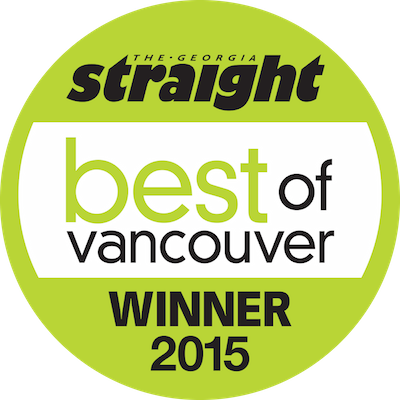 Since 2008, when the category first appeared in the paper, Miss604 has been the “Best Local Blog” winner or runner up. Since that same year, this has been my full time job. With an office that consists of myself, a computer screen, a cool wireless speaker my husband got me for Christmas and a coffee cup that’s always half full, I have built a career out of doing what I love. I don’t have a staff, I don’t have writers. I get up in the morning and do marketing, sales, accounting, editing, and publishing all on my own — and I love every minute of it. I love that I can post about local history, or a personal trip to Iowa, and you, dear readers, will still read what I have to say. I love that I can put the call out for local event listings and then get 300 emails in my inbox each month so that I can promote your art show, bake sale, charity fundraiser, play, or open house. I love that I get to interview interesting people and travel to wonderful places. Thank you for making my dream job a dream come true. Enough about me! There are dozens and dozens of wonderful winners who share this honour with me, in categories that range from dog spas to bakeries and news personalities. Here are just a few of the other categories in the Georgia Straight’s Best of Vancouver. Read the full list of winners online and pick up your copy of the Georgia Straight around town on Thursday, October 1st. Follow the Georgia Straight on Twitter for more results, news, and information. Thank you again!